The following is based on the Richard Pevear and Larissa Volokhonsky translation of this novel. 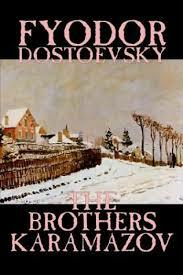 Fyodor Dostoevsky possessed amazing insight into the human mind. Many of the characters in the The Brothers Karamazov are drawn in intricate complexity. They are also lively and entertaining. It seems to me that they come close to real people. The portrayal of the entire Karamazov family is an aesthetic triumph. I could write pages and pages of commentary on the entire clan. Case in point is Fyodor Pavlovich Karamazov. The patriarch of the Karamazovs, Fyodor is a terrible father, a cheapskate and a sexual abuser of the mentally disabled. Fyodor abandons his sons at an early age, is lecherous and he refuses to part with money even when it is owed to others. He is repeatedly described as a buffoon. He is also often hilarious. What a marvelous literary creation he is. Though I am not intending a full-blown character analysis on Fyodor, I find Dostoevsky’s take on his foolishness unique. As the author spells it out, Fyodor’s buffoonery is a kind of pathetic rebellion against the world. I believe that there is something to this. We all likely have encountered people who behave so overtly clownish as to be embarrassing. I like to be careful when trying to fit large groups of people and a spectrum of behaviors into a single box, as I do think sometimes in an effort to create universal rules, we overgeneralize and thus turn insight into dogma. However, at least some of the time, the question arises; is this type of conduct truly a form of rebellion and contempt for certain aspects of society and behavior? Is it a safer way to challenge authority as opposed to outright defiance? There is a tradition of clowns and jesters speaking truth to power and getting away with it when no one else can. The concepts of seriousness, piety, honor, straight talking, etc. do seem to be challenged by this over the top foolishness. It makes sense, at least in some cases, to look at such clownish attributes as a kind of guerilla warfare against accepted convention. For instance, such real buffoonish behavior as disrespecting oneself, saying inappropriate things and being disruptive is in many ways counter to what is commonly considered honorable and polite comportment. This is illustrated hilariously in The Brothers Karamazov when Fyodor visits Zosima, an elderly monk characterized by pious wisdom. Fyodor succeeds in making a fool of himself by arguing with his companions, engaging in melodramatic outbursts and by addressing Zosima in inappropriate and pretentious terms such as “Great Elder” and “Sacred Elder”. I think in an odd way, this can be seen as contempt for so-called acceptable etiquette. It is an attack upon social conventions. In some ways Fyodor is a human satire of the society around him. This is but one little appetizer in a grand buffet of sociological and psychological commentary presented in this book. One thing that I loved about The Brothers Karamazov is that it is chock-full of such insights and observations. As I elaborated here, The Brothers Karamazov presents Fyodor Dostoevsky’s grand theory on God’s design of the Universe. As I also explained, Dostoevsky’s views are not at all compatible with my own as to the reality of existence. Yet, I love this book. It is no understatement to call it a sublime artistic achievement. In fact I would classify it as one of the finest works ever written. At eight hundred pages, this is a big book. 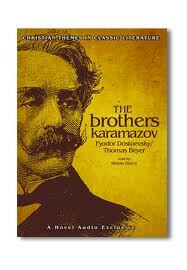 For those who are unfamiliar with the story, the buffoonish and immoral Fyodor Karamazov is father to four sons. Alyosha Karamazov is the pious and saintly youngest son. Ivan Karamazov is an intellectual atheist and sometimes a nihilist. 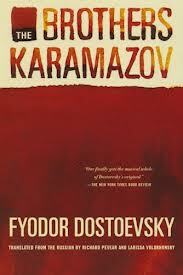 Dmitri Karamazov, the eldest son, is hard drinking, wild spending and lives life on the edge. Pavel Smerdyakov is an illegitimate son who is depressed and resentful. Agrafena Svetlovais (Grusha) a fickle young woman that Dmitri and his father fight over. There are numerous additional characters and connections. When Smerdyakov murders his father, Dmitri is falsely accused of the crime and a trial ensues. Dostoevsky has fashioned a work that contains some of the most dynamic and interesting characters who ever lived on paper. His writing style, at least as far as I can tell through the filter of translation, is amazingly inventive and aesthetically pleasing. The book was often hilarious when it was not tragic. The plot is extremely engaging. The novel consists of pages and pages of insights into human psychology and character, some of which are extremely perceptive as well as ahead of their time. Finally, the book is full of philosophical musings on the nature of reality that I, as I point out above, believe to be absolutely incorrect, but that is presented in a marvelous fashion. I kind of feel the following way about the book. I got into a car with a friend in New York with the intention of driving to Los Angeles. We spent weeks on road and drove thousands of miles. We met dozens of interesting people along the way. We explored cities, towns and natural features that I never knew existed. We had great conversations with each other as well as with the multitude and diverse set of characters that we encountered along the way. I learned all sorts of things about the world and even a little bit about myself. In addition to all this, we laughed an awful lot during the trip. It turns out that my friend was never good at reading maps. After driving all this time and distance we never made it to Los Angeles, in fact, we were so far off our route we ended up in Hoboken, New Jersey. However, I cannot help thinking that had we arrived at our original intended destination the arrival might have actually have distracted me from the benefits and wonders of the journey. Though we never made it to Los Angeles, if someone were to ask me whether or not the trip was worth it, whether or not I had a great time, whether or not I learned anything or whether or not I was changed by the journey, the answer would be so obvious that I need not even reply. More to come on this novel. The Brothers Karamazov by Fyodor Dostoevsky is, in part, an analysis and exploration of the author’s belief in the necessity of human suffering and doubt. Dostoevsky is practicing theology here. He is postulating what is required of a good Christian and a good person. In his worldview, one cannot just be born into happy circumstances, live a virtuous life and find God along the way. Instead, one must experience significant suffering and uncertainty on the path to salvation. Many permutations on this belief are expounded in the lives of various characters as well as through conversations and stories intertwined with the narrative. the theme of pain and doubt being a necessary part of the universe permeates throughout the book. Included in the narrative is a nuts and bolts philosophical explanation as to why these ills exist and why they are mandatory prerequisites to a truly pious life. There is a segment of the novel that is sometimes known as the Story of The Grand Inquisitor. This is an extraordinary piece of theological musing. Presented as an outline for a prospective poem by skeptic Ivan Karamazov, one of the brothers, it is “written” by Ivan as a critique of Christianity. However, it clearly encapsulates many of Dostoyevsky’s own views, as the attack upon Christianity is unmistakably hollow and ultimately fails. I must note that the piece does serve as scathing criticism of what Dostoyevsky sees as a terrible perversion of the Christian thought system, which in the author’s eyes is perpetuated by the Catholic Church and other human institutions. An official of the Spanish Inquisition, the Grand Inquisitor makes his living by having the innocent burned alive. One day Christ returns to Earth. Though he does recognize Christ for who he is, the Grand Inquisitor has him arrested anyway. What follows is the Grand Inquisitor’s explanation to Christ of both his actions and the actions of the Catholic Church actions, which Dostoevsky identifies with the abdication of free will and of Satan himself. The Grand Inquisitor focuses on the three temptations that the Devil offered Jesus. He sees these temptations as not only personal; they are actually Satan’s attempt at wrecking God’s plan for the universe. If Jesus had succumbed, free will would have perished. The Grand Inquisitor ironically believes that the rejection of these temptations was a mistake as he views free will undesirable. He advocates an all- powerful earthly church, which provides evidence of abundant miracles, provides material aplenty and is the source earthly power and authority. First, Christ refused the temptation of making bread from stones. The Grand Inquisitor, and clearly Dostoyevsky, sees this as God’s unwillingness to provide infinite material necessities to humankind. If God provided so easily for these needs, then inevitably everyone would become a Christian and follow God in exchange for such security. Thus free will would not really exist. At the Pinnacle of the temple, Christ refuses to hurl himself down and prove that the Angels will rescue him. The Grand inquisitor explains that a God that provides continual miracles is a God that everyone would follow as a matter of course. Though, once again, the Grand Inquisitor argues in favor of a world where miracles abound in order to convince the masses of God’s existence. Clearly, it is Dostoyevsky’s view that in such a universe, faith and, consequentially, free will would once again be subverted. Jesus’s final temptation involves him refusing control over the kingdoms of the world. Here, the Grand Inquisitor explains that this is God’s rejection of temporal authority and, not surprisingly, sees this rejection as a blunder. Of course, in the philosophy espoused by the author, a government tied too closely to religion would force its subjects to be Christians, once again negating the concept of free will. The Grand Inquisitor sees these rejections as flaws in God’s plan. If the Grand Inquisitor had his way, suffering would not exist, miracles would abound, obliterating skepticism, and the governments would enforce religious devotion. Free will and salvation would be unnecessary. Obviously, Dostoyevsky views the world’s ills (of which he includes religious skepticism) as necessary components in the concept of free will and the salvation of humanity. It ties in to the author’s message that suffering is also very crucial component in the individual’s successful search for God. Though not a believer, I have two observations concerning Dostoyevsky’s theology. First it seems logically elegant. It presents a coherent explanation for human suffering and the lack of strong everyday evidence of an omnipotent God. Furthermore, this explanation is supported by at least some parts of the Gospels. Second, though I would guess that Dostoyevsky would disagree with this conclusion, it seems more agenda centered as opposed to compassion centered. Though Dostoyevsky champions compassion and mentions God’s love at various points in the text of The Brothers Karamazov, this prerequisite of suffering built into the Universe defiantly puts God’s plan ahead of God’s desire to obviate human pain. In a world of torture, slavery, children murdered before their parents, etc., it becomes, at least for me, a much harder sell to say that God is all loving when the “plan” is more important than preventing these horrors. I am very aware that Dostoevsky’s interpretation of Christian theology is not universally shared by Christians and is not even embraced by the majority. It is not remotely compatible with my own view of the universe. With that said, not only is it an ingeniously laid out theology, but it is a belief system that Dostoevsky has presented in a way that conveys sublime aesthetic value. More to come on this work. Some general commentary on this novel is here. My biggest complaint regarding Lost to the West: The Forgotten Byzantine Empire That Rescued Western Civilization by Lars Brownworth is that it is too short. At 352 pages, this account covers over twelve hundred years of the history of the empire. A longer work would have filled in so much more detail and gaps. The narrative is gripping and even exciting. This book should have been 700 pages plus. With that said, this is a fascinating and enlightening account of the Byzantine Empire, or as the author contends, the second half of the history of the Roman Empire. This is the story of emperors and empresses, political intrigue and innumerable wars. It is also the story of an empire that fostered an unbelievably rich culture of art, religion, science and technology. For it’s relative brevity, Brownworth’s book does an amazingly effective job at balancing and telling this complex and diverse story. As I like to do, I want to focus on just one of several of the main points of this book. One of Brownworth’s major contentions is that the Roman Empire did not fall in 476 AD. Most of the traditional histories one encounters go something like this: in the fifth century, a Christianized Roman Empire was weakened by internal corruption and economic decay, this proverbial “house of cards” succumbed to “Barbarian” (I find that this word, which has become the standard to describe the diverse peoples who attacked Rome during this period, to be terribly inaccurate and misleading. Unfortunately, it has become so widely accepted that I must at least mention it here. Furthermore, Brownworth uses it without reservation) invasions and finally collapsed in 476 AD. A vestigial state in the East, known as Byzantium, lingered on after the fall of the west. The picture that Brownworth paints more or less mirrors what was my own less organized take on events up until this point. I can summarize it as follows: though not yet halfway through its lifespan, the fifth century was a dark time for the Christianized Roman Empire. The state was plagued by internal corruption, poor leadership and economic decay and was subjected to Barbarian attacks both inside and outside its borders. 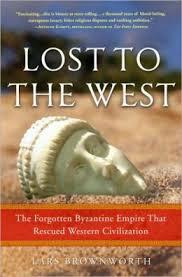 The Western provinces, where the decay was worse, were lost to the Empire. The East also came close to collapse. However, beginning around 470, a series of competent, even brilliant, emperors successfully reorganized the Empire and its economy, fought off and decisively defeated its internal and external foes. The reenergized Empire, whose vibrant heart and capital was Constantinople, went on to re-conquer many of its Western territories including Italy and the city of Rome. Though it could not hold on to all of the old Western provinces, the Empire flourished and lasted for another eleven hundred years. At times, it was the most powerful state in the region and even the world. Though I think that these are just alternate ways in viewing history and that there is truth to both assessments, I find that this alternate interpretation is in many ways more useful than more traditional accounts. There is a lot more here. I have only touched upon one of multiple and fascinating aspects about this book. This is the history of one of the richest cultures that ever existed. The interplay between the Imperial government and the Eastern Church is of particular importance and is also highlighted. It is also the history of innumerable characters such as Constantine I, Justinian I, Flavius Belisarius, Irene of Athens, Constantine XI and many others. I must give a few sentences to the legacy of Constantine XI, the last Byzantine and, some would say, the last Roman Emperor. Unlike the last western Emperors who cowered under the heal of their foreign overlords who eventually deposed them, Brownworth depicts Constantine XI as a virtuous, capable and brave man. Taking the reigns of a terribly weakened Empire that was constantly under attack from the Ottoman Empire, his heroic diplomatic and military efforts to save the state proved to be ultimately futile. He died on May 29, 1453, the last day of existence for the Empire. Constantine XI had the chance to escape to safety. Instead, he refused to abandon the Empire’s citizens. As Ottoman forces poured over the walls of Constantinople, bringing doom to Byzantium, Constantine charged into the enemy’s ranks, sword in hand, and fell along with the Empire. I find that Brownworth is a terrific writer of history. His prose is lively and fun but also informative and precise. One flaw worth mentioning, however, is that Brownworth at times shows a bit too much bias. He obviously has favorite emperors as well as those he does not like. He tends to celebrate those that he esteems while vilifying those he does not a little too much. This is just a minor quibble, however. His engaging style paired with such a compelling story makes this a must read for anyone in interested in this period. Though I hungered for more detail, this is one terrific history book. From time to time, I will continue my ruminations on a somewhat random Shakespeare sonnet. 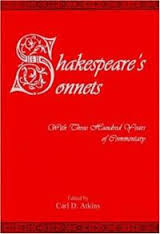 While I have no intention to move in numerical order or to cover every single sonnet, I found that, having intended on exploring Sonnet Number 11, I really wanted to take a look at the preceding Sonnets before doing so. The first 126 sonnets are a part of the “Fair Youth” sequence, in which the Bard is heaping copious praise as well as advice upon a young man. Critics have long debated whether these affections are platonic or not. The first eleven sonnets can be looked at as a subgroup, known as the Procreation Sonnets, and all closely relate to one another. Thus for now, I will jump back and ponder Sonnet Number 1. Obviously this is an exhortation to the worthy object to go forth and be fruitful and multiply. Furthermore, Shakespeare is ascribing the young man’s reluctance to do so as character weakness. The hesitation is compared to gluttony, one of the seven deadly sins. The religious connections, as well as the aesthetic beauty of the poem, raise this argument above the proverbial obnoxious friends and relatives who attempt to bully childless people into having families. Still, this is a somewhat unfamiliar Shakespeare to me. To be sure, the art form of sonnets is very different from that of plays. However, I am accustomed to a Shakespeare who shows human nature and not one who tells us what he is thinking. I also find that the worldview that Shakespeare presents, at least in the plays, is more often than not cynical and at times even nihilistic. I include the comedies in this assessment. Yet, here is a voice advising someone what is right, as well as how to live and even what is beneficial to the world at large. “Pity the world” if you pass on without having children. There are several possibilities. It could be that there is irony or parody here. A search through commentary on this group of sonnets does reveal a school of thought that this set of works is indeed a caricature of other poets and their works. I personally am having trouble detecting satire here, however. Or perhaps the “voice” of the poem may not really be Shakespeare but a character or point of view that he is simply projecting. Of course, we sometimes forget that great artists produce their works over a number of years and may shift into different moods and outlooks from time to time. Perhaps in this eloquent but unusual expression of love, the great poet is exhibiting an antidote to the darkness of the world by a prescription for the beautiful to procreate. Either way, there is one thing for certain. As Shakespeare urged his subject into creating something immortal in order to perpetuate beauty, he in turn created something immortal, thus perpetuating beauty, in this poetry.